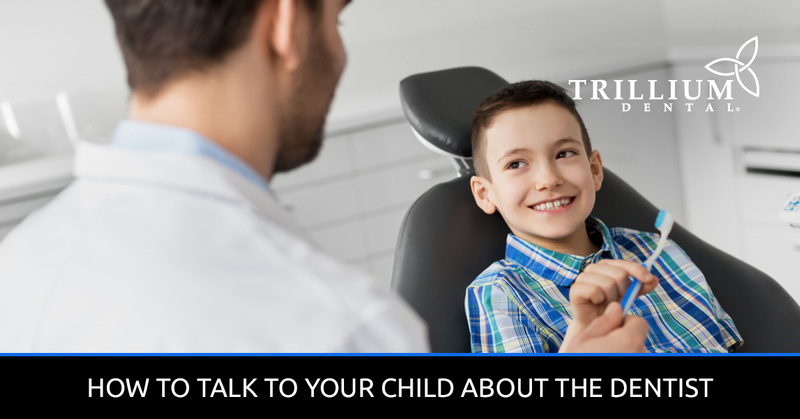 Talking to your child about the dentist, doctor, or any other medical profession isn’t always easy, as children have very vivid imaginations that can develop into fears if concepts are not explained in a way they understand. Because of this, parents often find themselves between a rock and a hard place when it comes time for their child’s first dental exam. After all, they want to tell the truth so their little one knows what to expect, but they also don’t want to instill any irrational fears or phobias. At Trillium Dental in Ottawa, our dentists and dental hygienists have years of experience in family dental care, and we pride ourselves on providing a comfortable, welcoming atmosphere for kids of all ages. For us, it all comes down to creating a fun environment for kids to show their curiosity and learn about their oral health. Book your child’s dental appointment with us today, or continue reading for some tips about how to talk to your child about the dentist! If your child is about to have their first dental appointment, odds are, they’re just one or two years old. Their vocabulary is already limited, so be sure to talk to them in a manner that they can understand. Start by showing them a toothbrush, toothpaste, and dental floss, and explain that every so often, they’ll be treated to a professional teeth cleaning with a little squirt gun and vibrating toothbrush (that sometimes tickles!). Don’t bring up needles, drills, or dental x-rays, because these are the things that tend to develop into dental phobias. In fact, most children don’t get cavities until their elementary school years, so avoid any talk of needles and cavities until they’re a bit older and can understand the concept of preventative oral hygiene. Until then, break it down using simple, positive language so they know the basics of what to expect when they have their first dental cleaning. It is also important not to hide information from your child, as this can throw them off when they arrive at your local dental clinic. Tell them that a dentist (or teeth cleaner) will take them back to a chair, where they can relax while their teeth are cleaned. Frame it as a pampering experience that doesn’t hurt, and they’ll be less likely to be afraid when their dental hygienist pulls out the electric toothbrush. The dentists and dental hygienists at our Ottawa dental clinics are great about explaining what they’re about to do in an easy-to-understand, kid-friendly way, so you can rest assured that your child is in good hands with us. We’ll explain our fancy toothbrush and water sprayer to them, and that if anything, it’ll tickle, not hurt. We’ll also let them pick out a toothpaste flavor and toothbrush color to take home, which they’ll find comfort in and maybe even get excited about. If your child is hesitant about their first dental visit, it is incredibly important for parents to lead by example. Let your child watch as you brush and floss your teeth, and show them how to do it at home before a stranger does it for them at the dental office. Talk to them calmly about what to expect, and don’t reveal any nervousness you may have about the dentist. Instead, tell them that they have nothing to worry about, that there are no needles involved in a teeth cleaning, and that they will have fun getting to explore the office. Ready to schedule your child’s first dental exam? Call Trillium Dental today, or request an appointment online at one of our eight dental clinics in Ottawa. We look forward to meeting your little one!